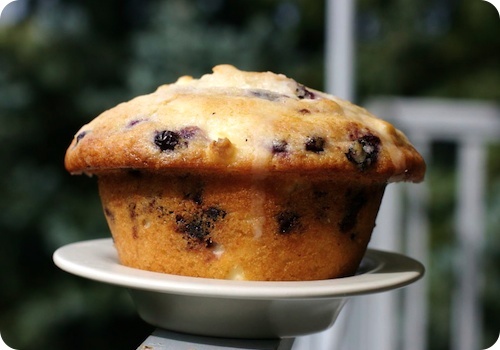 A mammoth muffin; from his cookbook, Marty Curtis' Lemon, Blueberry and Cream Cheese Muffins. Photo courtesy of Deep Media. Although I consider myself the giving sort, I have a confession to make. While I do believe that to be asked for a recipe is the highest of compliments, whenever I hear that request I do take a millisecond pause. I mean, of course I will share. But then again, if I give away all my tricks, will I have no mystique left? Marty Curtis boasts a love of food that is legendary in the Muskokas and seems to have no such qualms over divulging his recipes. Owner of Marty's World Famous Café in Bracebridge, Ontario, Mr. Curtis has recently released his first cookbook; a book that shares the favourties that have made his shop a success for the last 12 years. Even the secret of the house specialty, the absolutely enormous butter tarts, is revealed within. A warm welcome Mr. Curtis as first guest for the new "Seven Questions" feature on the site. In his interview, Mr. Curtis spoke about his inspirations in the kitchen, taste trends and finally, those much-lauded butter tarts. seven spoons: How do your café and the book reflect your food philosophy? Marty Curtis: Keep it simple. Easy to find ingredients that people are familiar with, when prepared with passion, make for an enjoyable, memorable meal. How you feel before you begin cooking is in direct relation to the end results. 7S: In the book you reference a similarity to Paula Deen in the way you've come to your success. You also have a bit in common with Ina Garten and Martha Stewart in that you left other careers to follow a passion for food. What advice would you now pass on to someone planning a similar leap? MC: Believe in yourself, feel positive and enjoy what you are doing. For me, having a greater purpose other than yourself will make your work much more enjoyable and a lot of fun. 7S: Marty's World Famous Café has been in operation since 1996; over the years what changes have you noticed in the tastes of your customers and how has your menu evolved? MC: Some people are wanting lighter menu items loaded with flavour and others still love hearty comfort food. Our phyllo quiche with locally grown leeks has been a big hit lately, served with a simple spring mix salad with olive oil and rice wine vinegar dressing. Our squash soup will appear again this fall as will our Turkey Pot Pie. All in all keeping up the quality is key. 7S: What trends or ingredients are inspiring you right now? MC: With fall upon us, I am getting excited about pumpkin and squash right now. Now is when we gear up for Thanksgiving time and we make our fresh pumpkin pies again and squash soup sneaks its way onto our menu once again. I absolutely love this time of year for the cooler weather and the smell of a roaring fireplace. The seasonal changes really bring out some creativity and make for fun culinary experiences too. 7S: Often you will hear chefs and cooks separate what they cook professionally, and what they cook in their own kitchen. Is that the case with you, and what is your go-to recipe at home? MC: I enjoy all the salads at home that you will find on our menu at the café. A great rib steak every now and again as well as a great rack of slow cooked ribs with grilled vegetables. As for a go to recipe ... the Trivial Marinade as mentioned in the cookbook is a go to recipe for me. It works with just about anything for the grill ... beef, chicken or pork. 7S: What are your five pantry or refrigerator staples? MC: Eggs, butter, pasta, veggies and fruit. 7S: And finally, the obvious question. Why share the secret of your famous buttertart recipe? MC: It makes me feel good to know that people now have the secret recipe and are able to recreate something in the comfort of their own home that has brought us success on many different levels. It's educational, fun and comforting. Everyone wins. Thanks to Marty Curtis for taking the time to speak with us. Look out for my review of Marty's World Famous Cookbook (Whitecap, 2008) coming up on Monday, September 15, 2008. The recipe for the Lemon, Blueberry and Cream Cheese Muffins is available in the book and online here (scroll down). With our impending arrival well on its way, we are currently attempting to reiterate the importance of sharing to our first born. Though his universe has happily (and steadily) revolved around Ben for the past two years, we have come to the point when patience, respect and understanding are becoming part of our daily conversations. I am terribly thankful for his gaggle of contemporaries who help him in his education. He has had to learn that not everyone plays with blocks in exactly the same way, that many little hands can create stories with the Little People and that cuddles can be given to cousins and friends - not just Mummies and Daddies. He has started to learn to take his time with those younger, to allow for the independence of those older, and to realize that he is not the only one who would like a cookie. He has seen that our lives are interconnected with those of others; we share our days and ourselves, as well as our toys. Such is the case with our Valentine's Day festivities. Even though Sean and I will have our own evening out, the day itself is saved for the shared celebration of both the sweethearts in my life. Each bring me such happy contentment, Benjamin will see that instead of choosing just one (something I could never do), I would rather choose to spoil everyone. He will see that treats, consideration and hugs can be shared equally, and that there is as much joy in the giving as in the receiving. A weeknight family dinner calls for a dessert that is special but does not take too much attention away from enjoying everyone's company. Nothing too elaborate or fussy, an offering as perfectly sweet as those gathered around the table. 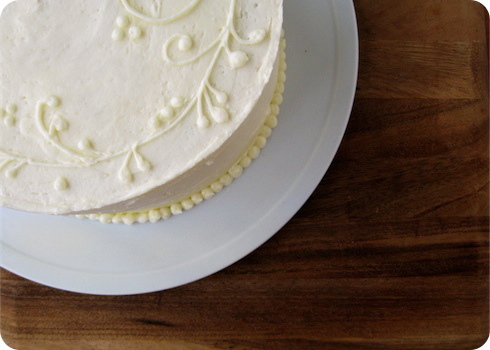 This cake is dense and moist, with the fine texture of a pound cake. The richness of butter and cream cheese is underscored by mellow almond and luscious bits of white chocolate that only almost melt into the batter. Perfect on its own, sublime when topped with raspberry sauce, and decadently stodgy as the base of a midwinter trifle - it is sure to send more than one heart aflutter. If one happens to have miniature tube or Bundt pans, this batter makes adorable little plated desserts; the perfect size for two, or in our case three, forks to share. From a variety of inspirations. Preheat oven to 350°F (175°C). Using a pastry brush or kitchen towel, lightly coat a 10" tube pan with melted butter. Sift together flour and salt in a medium bowl. Set aside. In a stand mixer with the paddle attachment, or with an electric beater, cream together the softened butter, cream cheese and sugar on medium-high speed until light and fluffy. This will take about 5 minutes, being sure to scrape down the sides of the bowl periodically. Add the eggs, one at a time, scraping down the sides again and beating well after each addition. Beat in vanilla and almond extracts. With the mixer on low, add the flour in two additions, alternating with the milk. Mix until just combined. With the mixer still on low (or with a rubber spatula), stir in the white chocolate. Pour the batter into the prepared pan, mounding the edges up slightly and leaving a bit of a furrow through the middle. Hit the pan against the counter to remove any trapped air bubbles. 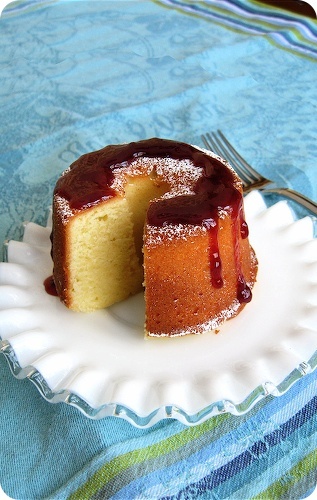 While cake is baking, combine the water, sugar and almond extract in a small saucepan over low heat. Cook until the sugar is dissolved and the syrup becomes thick. The cakes should be done after 75-85 minutes, until a cake tester inserted in the centre comes out clean and the top is golden brown. Allow to cool in pan, on a wire rack, for 10 minutes. Turn the cake out onto the rack (see note) and, use a pastry brush to coat the cake entirely with the syrup. Allow to cool completely. • You will want to suspend the rack over a sheet pan to catch the excess glaze. A spoon can also be used to glaze the cake, but I prefer the finer finish a pastry brush offers. 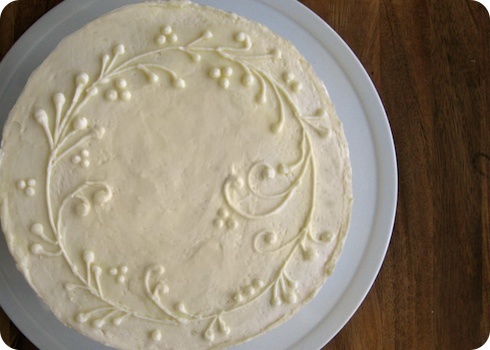 • For a citrus variation, omit the almond extract and white chocolate from the cake. Add 1 teaspoon grated zest of your choice and one tablespoon of freshly-squeezed juice replaces the same amount of milk. For the syrup, omit the extract and substitute juice for the water. • For a chocolate chip version, the white chocolate can be substituted with 3/4 cup bittersweet and the almond extract can be omitted (but this is not necessary). The syrup is made more of a glaze, substituting the extract with 1 teaspoon cocoa powder and boiling the mixture gently for 5 minutes. Spoon this over the top of the cake, allowing it to dribble down the sides. This past weekend, I was going to do a lot of things. I was going to deal with that pile of laundry. I was going to read a bit more of that book on my nightstand. I was going to wax rhapsodic, again, about the gorgeousness of the season. I was even going to make tremblingly pretty Gewurztraminer gelées, studded with plump blackberries. You will note, I was going to do those things. In fact, I did not end up checking any of those tasks off my list. The weekend turned out to be a fabulous one, and I was taken with other diversions. Come Monday my mood was so bright that I felt the need to celebrate the weekend's end; it was that good. The aforementioned berries were glorious specimens of Loch Ness blackerries from the kind folks at Schouwenaar Orchard and Vineyard. Large and glossy black, the pine cone shaped bundles were simply addicting. Starting out with a full flat of these babies, we'd munched our way through the majority by Sunday evening. Too perfect to mar with cooking, too pretty to hide under mounds of cream, the crowning glory of a fruit tart seemed destiny for the last of the tempting fruits. Wanting something as special as the weekend had been, I decided upon Martha Stewart's pistachio pastry crust for my base. More of a shortbread than a traditional pie crust, butter is even more enriched by the addition of ground nuts. The pistachios in turn tint the pasty a delicate chartreuse. My buoyant mood was not one that allowed for the patient stirring required for a pastry cream, so I turned to a simple alternative; thick mascarpone whipped to luxurious lightness, barely sweetened and scented with vanilla. The perfect backdrop to the blackberries, the perfect end to the perfect weekend. No agenda needed. Prepare pistachio pastry dough as per recipe. On a lightly-floured work surface, roll out chilled dough to a 1/4" thick, 12" round. Lightly press dough into a 9" fluted, removable bottom tart pan, then chill for 10 minutes. Using a paring knife, trim excess dough. Scraps and leftover dough can be rerolled once and then baked as shortbread cookies. Preheat oven to 375°F (190°C). Prick (dock) pastry all over to prevent puffing during baking. Line with parchment paper, leaving an overhang over all edges. Weigh down with pie weights, uncooked rice or dried beans, and bake for 20 minutes. Remove parchment and bake an additional 10 to 15 minutes, or until the shell is lightly browned all over. Cool on a rack for 10 minutes, then remove tart ring to cool completely. Melt chocolate using a double boiler or microwave, then set aside to cool slightly. Once cool, use a pastry brush to thinly coat the inside of the cooled shell with chocolate. Chill for 10 minutes or until set. Meanwhile, in the bowl of a stand mixer fitted with the whisk attachment or with a hand mixer, beat the heavy cream, vanilla and sugar until soft peaks form. Remove from mixer and set aside. Switching to the paddle attachment, cream the mascarpone until light and fluffy. On low speed, gently stir in half the whipped cream until just combined. Using a spatula, gently fold in the remaining cream. Fill the prepared shell with the mascarpone mixture. Chill the tart for 20 minutes to firm up the filling or prepare to this point up to 3 hours ahead of time. Melt the jam, with a scant 1/2 teaspoon water, using low heat in the microwave. Remove from oven and stir. Set aside to cook slightly. 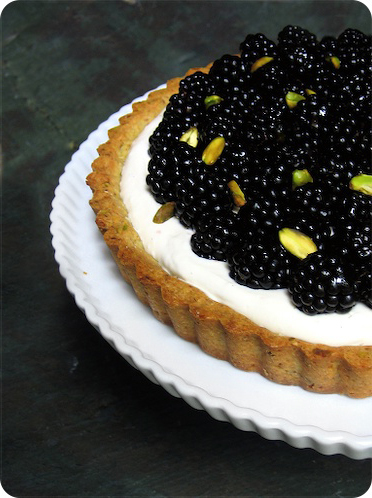 Top the filled tart with blackberries, then lightly brush lightly with glaze. Scatter with pistachios and serve immediately. • This filling is not particularly sweet; you may want to adjust the sugar to best suit your tastes. • Neufchâtel, blended ricotta or cream cheese can be substituted for the mascarpone. In these cases, amount of heavy cream may need to be adjusted accordingly. • The pistachio crust I used is not available online, but I would think that Martha Stewart's Pistachio Graham-Cracker Crust would be a fine substitution, as would a classic pâte sucrée. • It hardly needs saying, but this pastry and filling can be used as a basis for almost any fruit tart. had similar notions this week; two tastes of the same theme!